Meet your neighbor Karna Peterson of Stronghurst. Karna was born and raised in Rio, a small town just north of Galesburg of 218 people according to the last census. Karna is the newly appointed Stronghurst and Carman United Methodist Church pastor and assumed her duties on July 1st. She is the daughter of Laverne and Marilyn Peterson of Rio. Her parents farmed in Rio for several years and her dad was the Postmaster there. Karna has two brothers, Gerald (Sharon) Peterson who live outside of Woodhull. Gerry farms and they have one daughter, Jennifer. 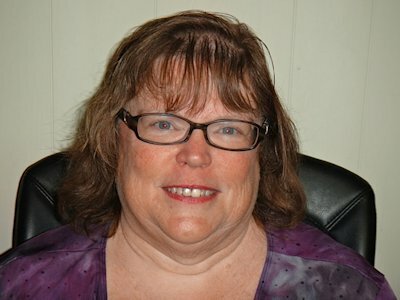 And Dwight (Maureen) Peterson who live in Milton, Massachusetts. Dwight is self employed. They have four daughters, Erin (Karl) Banty, Brittany, Morgan and Jessica Peterson. Karna graduated in 1974 from ROWVA High School and attended Carl Sandburg Jr. College. She was previously employed at J&J Dog Supplies for 38 years in Galesburg. The company was sold in February of 2014 and moved to Colorado Springs, CO and Karna went there to help train new employees. In her spare time she enjoys sewing, embroidery, knitting, and reading. She also trys to fly or drive to visit her brother's family in Massachusetts once a year. "I try to fill in by helping fill the spot of a grandmother," she said. Stacy is the mother of Kourtnie and Kolton in Galesburg, and Andrea has Carter, Brenne and Aaron and lives in Victoria. She enjoys going to her god-children's sporting events including soccer, baseball, basketball and cheerleading. Karna will begin classes in Bloomington at the end of July to obtain her license to preach at the "License To Preach" school through the United Methodist Church. Karna invites you to come to worship service on Sundays. Carman services are at 9:00 a.m. on Sunday and and 10:30 at Stronghurst.